Imagine you're controlling a party of the best fighters on the planet and you're in an all out brawl for your life! You have the ability to interact with your environment like dragging opponents into lava, sending electricity through water, and hiding from arrows in the forest. You can rush into town to buy more gear or sell off unused equipment. You'll need to use the resources available to you in your hand and your position to outwit all your opponents! This game checks all the boxes for me when I'm looking to add a game to my collection. There's an amazing video selling the vision for the game, it's highly rated on BGG, the game mechanics are ones I know and love, and it's got a classic theme. Absolutely incredible. Normally the fighting on a grid style mechanic turns me off to games but this looks like a great execution of that concept. There's so much to love about the design of this game. The fact that around the edges of the map are the villages where you buy new cards to add to your deck but also leave you vulnerable to attacks is great. There's a lot of map terrain that has significant impact on the gameplay but each leave room to a weakness. The damage keeping mechanic of sticking daggers into holes on the minis is brilliant! It's difficult to describe all the clever design choices packed into this game. You should just watch the campaign video yourself. 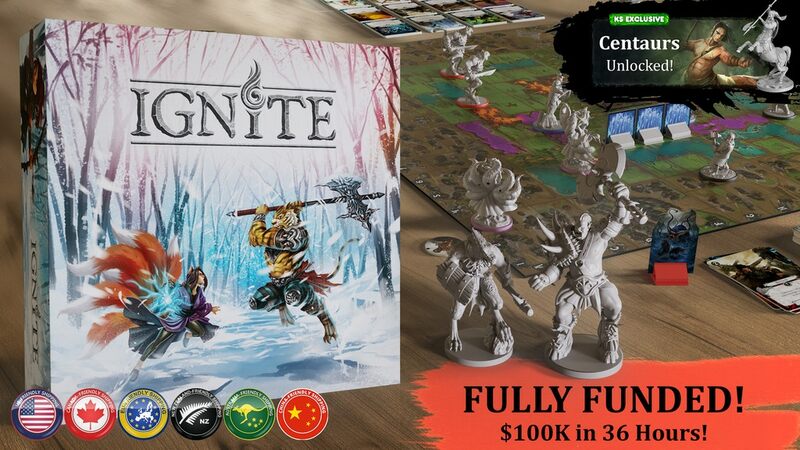 You can get your hands on this epic in a box for $89 before the campaign ends on May 2nd. 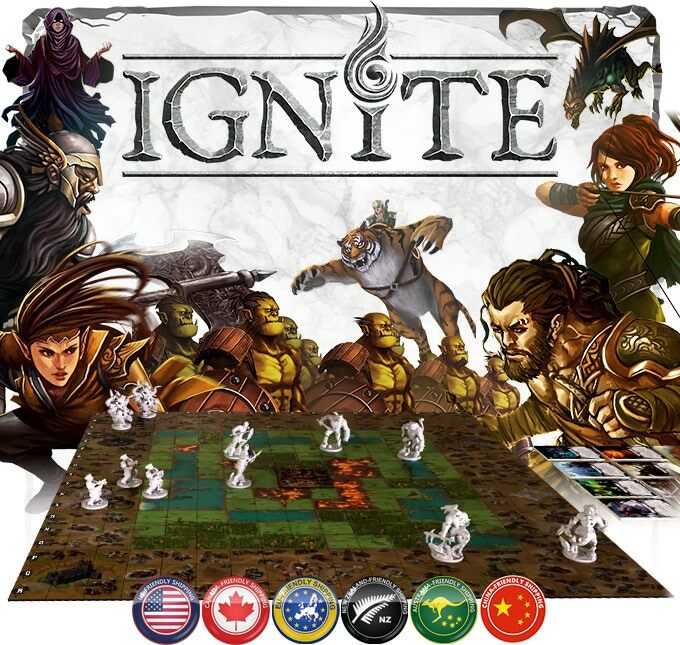 Ignite is the first game of its kind, a fast-paced, strategic, battling deckbuilder where asymmetric races battle for supremacy over the land of Oshos. All 1-6 players (up to 8 players with Stretch Goals) (Solo/co-op play only with "A New Enemy" expansion) begin with the same meager equipment and weapons. Then, through shrewd purchasing, tactical movement, opportunistic attacks, and the use of terrain effects, players match wits on the battlefield. Whoever claims the most trophies becomes the dominant race of the land. See more about the game including more of the cards and races on the Kickstarter page! Check it out before it ends on May 2nd, 2019!